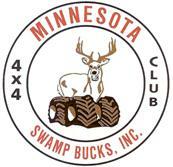 The Minnesota Swampbucks 4×4 Club is a family orientated organiziation interested in and promoting the legal and enviromentally responsible activities of our sport. We are a member of the Minnesota 4 Wheel Drive Association and work with other organizations to help protect off-road areas. The Swampbucks are based in Jordan, Minnesota, but have members from all over the metro area. The Swampbucks started out as mud-racers, but have evolved into trail-riders. Come join us! New friends are always welcome. Nice job with the new website!! 7:00 p.m. on the 3rd Wednesday of every month. Firehouse Grill in Elko New Market, MN.